I used my newly-acquired set of V6s for the first time for a wedding last night (two Cactus RF60 and two Canon 580 EX II off-camera on lightstands, and V6s in TX mode on my Canon 5D mk3 and Fuji X-E2), and I have discovered one small "gotcha" that you may like to know about! My aim was to be able to use different power settings on each transmitter, so that I could use different apertures on my lenses - for example F5.6 on the Fuji with a wide-angle lens for an overall view of the couple's first dance, and an 85mm at F1.8 on my Canon for shallow DOF close-ups of the couple. The problem that I had was that when I switched cameras, the flashguns remembered the power setting that was last used on the other camera, so I was getting underexposure when going from the Canon to the Fuji, and overexposure changing from Fuji to Canon. I could not figure out what was happening at the time, so was constantly adjusting my ISO and aperture to compensate. Anyway I did some testing this morning and discovered the reason. If you have two transmitters set to the same radio channel, controlling the same off-camera flashgun(s), the off-camera V6s or RF-60s will remember the last power setting used. What you have to do if you want to use a second transmitter that has a different power level, is to flick the control dial on that V6 one step to left or right and back again, to send an update to the off-camera V6 receivers. Then they start working at the correct power for that camera's setup. So it seems that the Cactus V6 does not send a power setting command each time you take a picture, only when you make a change with the control dial on the V6 in TX mode. So is it possible that in a future firmware update, the V6 transmitter could be made to send a power level command each time it triggers the remote flashes? I can work around this by flipping the control dial one step and then back, but it would be easier if I didn't have to! It is possible to synchronize the power level on both Rx and Tx unit before each shoot, but we don't recommend doing it. The reason is that the V6 has to spend an extra time to proceed the synchronization and take negative effect on the flash sync speed. A delay between flash sync and camera shutter release will probably happen. Our engineering team will discuss other possible ways to handle your case soon. I will keep you posted. If you have other comment, please feel free to let us know. On the V6 Tx unit, flipping the control dial one step and then back enables to send signal to other V6 Rx unit. We had a discussion to simply this operation, but that will require to assign this function to existing button where has other function already occupied. It will confuse the user interface. But if you have other suggestions, please let us know. I am having the same problem. A product as good as the Cactus V6 is for weddings should be able to function in a multi-transmitter environment. I had no clue that this is how they would function and am very disappointed. Between myself and my second photographer, we need three cameras to be able to control three off-camera flash units. Whatever is set on each transmitter is what should get sent to the receiver. I just spent $420 on these things and this is a huge dealbreaker for me. Please help. there has to be something that can be figured out. Maybe an option for me to press the test button on the transmitter before taking the photo for me to take control of the receivers, seems like that would make the most sense and be incredibly fast. This does not appear to be much more complicated than pressing the test button. 1. Send the power level before each shot. As wedding photographers many times we don't need to sync the flashes at 1/200, maybe the engineering team will be able to provide this at 1/100, this will make a lot of wedding photographers verry happy. 2. Send the power signal after each shot. This way we will know that when we change the camera that the first shot will be over or under exposed and fire a calibration shot. I had a "similar problem" with PocketWizard TT5. To make it even fancier and to don't confuse existing users let us choose the way this works. Make it default in the menu the way the triggers work now and implement this two new options. I think you can make incremental changes in firmware because the 2nd option, power signal after each shot can be simply implemented without so much testing. We only need the power of a few (one) software developers. I really hope that this will be implemented soon. PS I just got the triggers two hours ago and I don't regret a second that I sold all my PocketWizards. Great product. Perhaps pressing the test button could send power levels in addition to performing the triggering? This would be an alternative to your solution 2. that wouldn't wear down the camera's shutter and wouldn't create an unwanted image. A third idea would be to keep transmitter power levels synchronised all the time, but I don't think this could be achieved with the current V6 hardware, and also it may not be what you want, when you change cameras. I'd say that any extra radio communication supporting the use of more than one transmitter should be optional, because I reckon most people use just one transmitter and shouldn't pay the price (e.g., in battery lifetime) for supporting multiple transmitters. I don't think the test button will be a solution because sometimes you can forget about it and many won't care about the shutter wearing down, it's not a lot of shoots. If you press the test button you need another hand and many times the other hand is holding another camera or is putting the other camera safe on the other strap. I really hope that this thread is seen by an administrator to pass the word to the developing team. We would like to thank you for all the suggestions you have raised in this topic. Our team has discussed each of them and would like to share with you the pros and cons these proposals. - Pros: Resolved the issue completely. - Cons: Not possible in the current framework due to the time limit. - Pros: Can be implemented easily without the need of altering the current framework. - Cons: The sacrifice of sync speed would be too much that may make the slow triggering not useable. Our evaluation is that the maximum sync speed has to lower to 1/30s or 1/15s if we implement such proposal. The sync speed would be too slow for most of the photo scenes. - Cons: Users has to bear in mind that the first exposure maybe incorrect after changing camera (and the TX connected) each time. - Pros: Photographers can assign different group combinations to different TX, so that with a little preparation before the operation they could still trigger the same set of flashes to fire as per the request of multiple TX. - Cons: Require TX to send group activation/deactivation status when triggering, which could not be applied in the current V6 framework due to the time limit. - Pros: Easily implemented via firmware updated. - Cons: Photographers may be too busy to remember pressing the test button each time after changing camera, or their left hand too busy to press the test button during the photo session. - Pros: No firmware update needed. Photographers simply follow the rule of ‘last to adjust, wins’. - Cons: Photographers may be too busy to remember tweaking the V6 during the photo session. Before implementation of any firmware changes, it is recommended to follow 6) as a workaround. 3) Power level sent after each triggering (in addition to the original transmissions being sent when any adjustment is made), as suggested by SBP. 5) Pressing test button once on TX to send power levels to the RXs, as suggested by ngiardina. Which do you think is a better approach? AFAIC, solution 3) is unsatisfactory when one considers multiple shooters sharing receivers at the same time. Moments will be lost due to the first exposure not being correct and there will be many gratuitous flashes irritating subjects / guests and depleting flash batteries for "taking over" pre-shots. Solution 5) should work with a half-press of the test button already. It would be suboptimal to trigger all flashes just in order to transmit the power levels. Solution 4) only requires the transmission of four additional bits. I have difficulty seeing that this should have a devastating impact on the max. sync time. The number of additional bits could be further reduced by assigning IDs to transmitters (1-4). Then only two bits would have to be added to indicate which transmitter sent the trigger event. Concerning 3): Yes, it is not a satisfactory solution considering the frequent occurrence of wrong exposures, or the need to “test-fire” the flash after changing cameras. Concerning 4): The transmission packet of V6 has reached a bottleneck now. There is no space for even a little additional info to be communicated during the triggering event. Besides, even the power levels of different groups or different TXs has been transmitted to the RX BEFORE the triggering event, it still takes time for the RX to shift among groups or among power levels DURING the triggering. The time required for the shift has already exceed the time limit of syncing the flash. Concerning 5): Yes, half-press seems to be a better solution. In regard to solution 4, why would it have to send the group activate/deactivate on trigger? It should only need to send the group activate/deactivate when i activate or deactivate a group on either Tx module. If the receivers have the capability currently to be a member of more than one group, this seems like the way to get it done. I really feel like for me, as a wedding and event photographer, this is the only feasible way to make this work. If solution 4 is absolutely not feasible, then solution 3 is the only other practical answer. In the current design, the group on/off status of a V6 RX follows the rule of ‘last to adjust, wins’. Try switching on one V6 in RX mode, and switching on two V6 in TX mode. The power level and the on/off status of the RX will always follow the setting of the V6 TX that you have made any adjustment in power level or group on/off status recently. Suppose the RX now can be set two groups A and C. A is for the use of TX1 and C for TX2. The RX will store two power levels (e.g. A=1/1, C=1/4) whenever two TX are in operation. Now the RX has to decide which TX configuration should it follow in the next triggering. Should it fire 1/1 or 1/4? In the context without TX ID, the RX does not know which to follow unless the triggering signal also comes with an info indicating which group(s) does the TX wish to fire. That makes the group on/off status necessary to be accompanied with the triggering signal in a multi-Master environment. 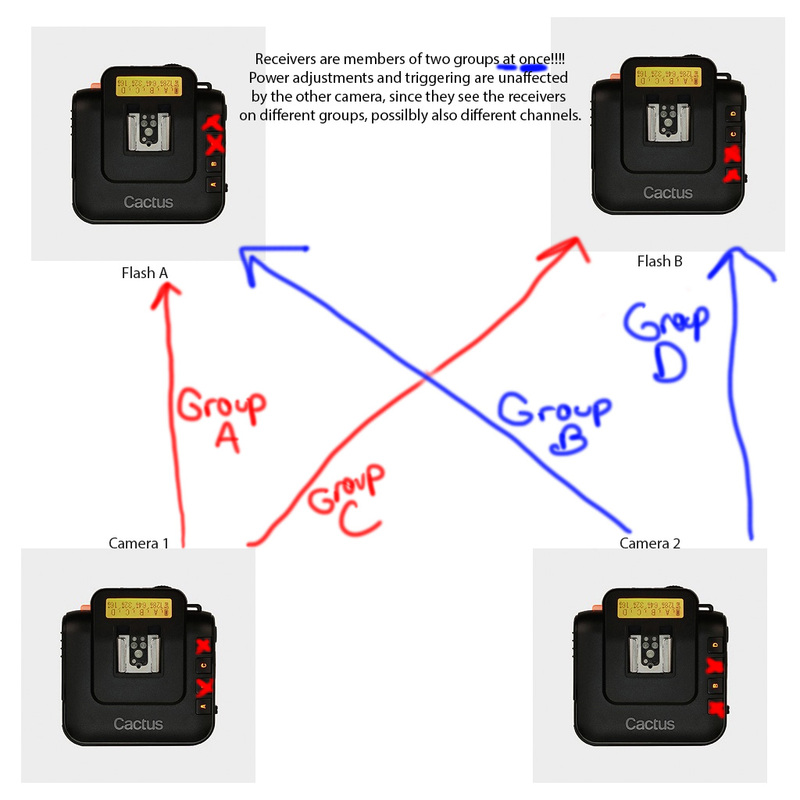 Concerning proposal 3), do you think the issues raised by Class A (“Moments will be lost due to the first exposure not being correct and there will be many gratuitous flashes irritating subjects / guests and depleting flash batteries for "taking over" pre-shots.”) would defeat the purpose of the solution? I understand now. So the flaw in the design is the fact that the Tx broadcasts its signal to all of the groups and the RX decides if it should fire? I don't know anything about your framework, but that seems like something that should be remedied and then the problem will take care of itself. If the RX gets an incoming signal on group B, then it should fire with group B's parameters. If it gets an incoming signal on another group, it should fire using that group's parameters. Right? Seems like you are saying the RX can't tell which group the signal is coming from in the current design. As far as proposal 3 is concerned, yes it will cause moments to be missed, but the current system is much worse than that. So, just to clarify, I'm saying improvements in the TX firmware may be able to fix the problem. Change the TX signal so that it only fires the groups that are powered on and eliminate the need for the group status signal. You are right, it would not be necessary to send the group activation status on trigger. However, if you expect different V6 Tx triggers to have different effects on one and the same V6 Rx then there is no way around the fact that additional information that identifies the V6 Tx has to be transmitted. A triggering event is very time critical. If the transmission of data or its processing takes too long, the maximum sync-speed can be reduced to unusable levels. I hear Cactus saying that they cannot accommodate more info in the triggering event than they already do. It also needs to be considered that the flash attached to a V6 would have to be re-configured by the V6 to a new power level at the time of triggering, which may take way too long. I really feel like for me, as a wedding and event photographer, this is the only feasible way to make this work. At each position where you want to share a V6 receiver, put a second V6 receiver with another flash attached to it. Then two shooters can work independently with different power levels, there will be no lost shots, battery life will be better, and the only chance for conflict is when they both fire the flashes at the same time. I have great difficulty understanding how proposal 3 would be acceptable to you. It would basically be the same as using a trigger that fails to trigger in random ways. Would you use a trigger that fails to work every now and then? Probably you wouldn't, however, transmitting power levels after the shot as in proposal 3, would practically have the same effect. In the extreme case you and your second shooter would alternate in taking photos and neither of you would ever get the right exposure because for a successful photo to be taken one of you has to take at least two photos in succession. Whenever you take a photo, you do it when the moment is right, don't you? With proposal 3, you'd never know whether you will be successful in capturing that moment. Proposal 3 seems unacceptable to me. So the flaw in the design is the fact that the Tx broadcasts its signal to all of the groups and the RX decides if it should fire? I don't see a flaw. By the nature of radio communication, a Tx signal will be broadcast to all receivers. You cannot single out a particular Rx as a receiver. Therefore, an Rx always has to decide whether to respond to a trigger event or not. Tying a trigger event to a certain group would not be efficient (see below). According to my understanding, a trigger signal is not associated to any group. It is just a single piece of "fire" information and any V6 receiver that receives this event and is in an active group, will fire an attached flash with the currently known power level. In the current V6 design, there is no need for the trigger event to contain more information and it is good to keep the trigger event as small as possible to minimise the trigger delay. If you want to extend the V6 design so that a V6 receiver can be in multiple groups at the same time then it becomes necessary to extend the trigger event with information from which Tx it originated from. still require to send power levels during the trigger event because shooter X could have set group B to 1/1 while shooter Y could have set group B to 1/4. I guess my misunderstanding is that when the Tx sends the fire signal, it is not sending a "fire A" or "fire B" signal, but simply a fire. I guess the question I am asking is why couldn't "fire A" be broadcast at 2.4105 gHz and "fire B" be broadcast at 2.4110 gHz? I made those numbers up, but I hope you see my point. If the receiver receives a "fire" at 2.4105, it will fire group A, and if it receives a "fire" at 2.4110, it will fire group B. Does that make sense? I hope it does. Thanks though dude. I appreciate your time and effort in clarifying. I honestly think the simplest solution will be to buy a couple more v6 units and a couple more flashes. $170 per Godox flash and $70 per V6 isn't super cheap, though. It is also a little bit disappointing. I would love solution 3! It is an ideal solution right now for one shooter. If the shooter has the time and the free hand to change the power level can do it now by turning the selection dial left and right, if not, just fire one shot. You don't need to fire a calibration shot every time, this option may be a good one if your primary concern is the moment not the batteries or one more flash pop. In practice I found that even PocketWizard TT5 would screw the first shot with the camera. For multiple shooters with shared flashes, not at this point in time. Even with the new godox flash with liIon batteries I think it's too much because the protection will kick in fast. In this scenario the photographers would not be in sync For the second shooter I plan to use another channel at this time. I agree with @Class A that to send the latest TX settings on half-press. I assume half-press on the shutter button will wake up the flash on all RX V6s. Usually there will be a delay between half-press and full-press to take a shot. How much time it takes to broadcast all the data? Maybe it will be enough time to transmit all data before the shot is taken. There might be a chance where two or more photographers are half-pressing at the same time. Possible solution is to make the RX lock on the the TX which first initiated data sending and ignore data from other other TX until the full data packets are received. Means the TX which first initiated and completed data sending will be given priority. I'm not sure how feasible is this solution in terms of radio communication and data corruption avoidance since the RX does not have the mechanism to tell the data is coming from which TX. I wonder if there's any wireless trigger system that support multiple transmitters and receivers. Thank you yungyaw for the suggestion. I've forwarded your message to our engineering team for consideration. My solution has always been to have separate flashes for each camera but I get the pro of only having to carry have the flashes to a wedding.